Cartilage and bone health are important for long term wellbeing. 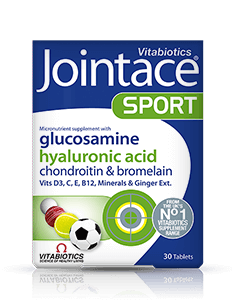 Jointace Fizz has been developed by Vitabiotics nutritional experts and provides unique combinations of trace minerals, vitamins and nutrients, ideal for those with an active life, in sport or in later life. Jointace Fizz makes a great tasting orange & ginger drink. 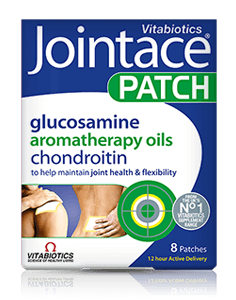 Its unique formula delivers high strength glucosamine and chondroitin with other synergistic nutrients, in a convenient and easily absorbed form. Magnesium helps to maintain normal bone. It also contributes to normal functioning of the nervous system and normal muscle function. Vitamin C contributes to normal collagen formation for the normal function of bones and cartilage. It also helps to maintain the normal function of the immune system during and after intense physical exercise. 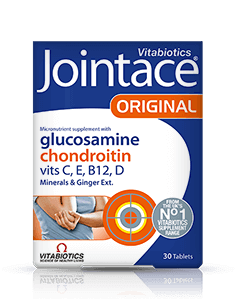 Along with magnesium, Jointace Fizz provides Glucosamine present in the preferred potassium form, and a high quality LMW (low molecular weight) form of Chondroitin, together with Ginger Root extract, a well-known botanical ingredient. 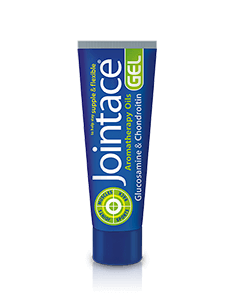 Jointace Fizz has been formulated using scientific research and is produced to high GMP (Good Manufacturing Practice) standards of quality control. 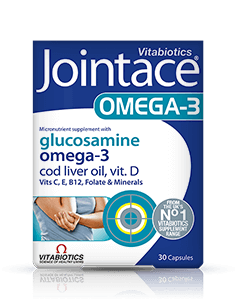 Jointace Fizz contains glucosamine but you can take a regular Jointace tablet or capsule supplement too if you wish to provide additional levels of glucosamine together with fish oil and other important nutrients. 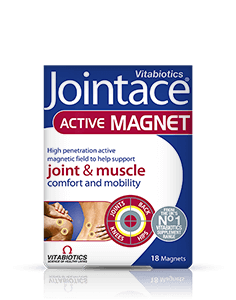 Jointace Fizz is available in the UK from Boots, Superdrug, Tesco, Waitrose, supermarkets and pharmacies, health stores including Holland and Barrett. Alternatively you can order online here. Citric Acid, Sodium Bicarbonate, Glucosamine Sulphate 2KCl (from Fish/Shellfish), Sweeteners (Sorbitol, Mannitol, Sucralose), Flavourings (Orange [Maltodextrin, Acacia Gum], Lemon [Maltodextrin, Acacia Gum, Citric Acid], Apricot [Maltodextrin, Dextrin, Glyceryl Triacetate, Acetic Acid]) (contains Sulphur Dioxide), Magnesium Carbonate, Chondroitin Sulphate Sodium (from Fish/Shellfish), Sodium Carbonate, Vitamin C (Ascorbic Acid), Redbeet Powder, Ginger Standardized Extract, Colour (Riboflavin-5-Phosphate) Allergy Advice: For allergens, see ingredients in bold. DISSOLVE ONE TABLET IN A GLASS OF WATER, to make a refreshing orange and ginger flavoured drink. Take once or twice daily. Do not exceed the recommended intake. Diabetics and those taking anti-coagulants (blood thinners) should consult their doctor before using this product. Food supplements must not replace a varied and balanced diet and a healthy lifestyle. As with other food supplements, seek professional advice before use if you are under medical supervision, pregnant, breast-feeding, suffer from food allergies, or are allergic to any of the ingredients. Allergy Advice: For allergens, see ingredients in bold. Why has Jointace Fizz been developed? Can Jointace Fizz be used simultaneously with medicines? How many tablets does one pack of Jointace Fizz contain? How and when should Jointace Fizz be used? 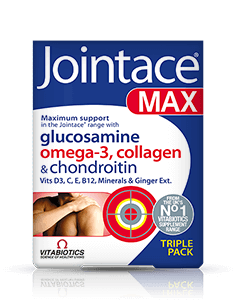 Are there any undesired effects whilst taking Jointace Fizz? For how long should Jointace Fizz be used? 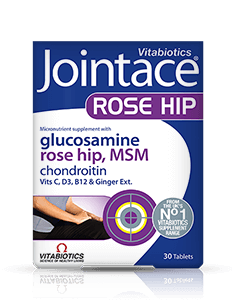 Is Jointace Fizz recommended with any other Vitabiotics' product(s)? 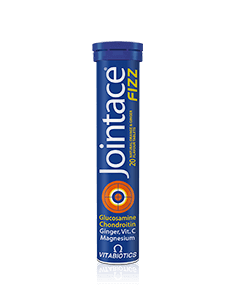 Does Jointace Fizz contain sweeteners? Please note that any health tips or advice provided on this site are not intended as, and should not be regarded as a substitute for medical advice from your doctor or health professional. Always read the product directions before use. Do not exceed the recommended intake. As with other food supplements seek professional advice before using if you are pregnant, breastfeeding or suffer from food allergies. 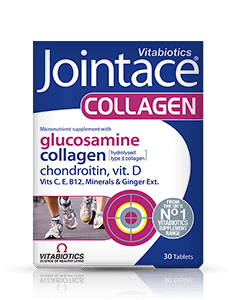 Jointace Fizz is a food supplement that contains glucosamine sourced from natural chitin. Do not take if you are allergic to fish or shellfish. Consult your doctor or pharmacist before using this product if you have an underlying medical condition (e.g. epilepsy, hyperthyroidism), or if on medication. Diabetics and those using blood thinning medication should consult their doctor before using this product. Vitamin supplements are not intended to treat or prevent any disease. Food supplements must not replace a balanced and varied diet, and a healthy lifestyle.